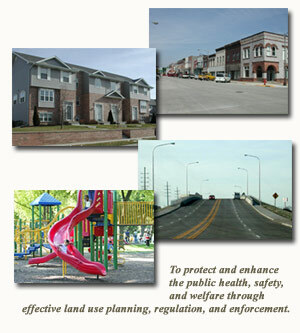 The Kankakee County Regional Planning Department is part of Kankakee County's full-time professional staff and is responsible for administrating and enforcing adopted ordinance and plans relating to new and existing development within the unincorporated areas of the County. All petitions for Kankakee County Board approval having to do with the use of land are processed through the Planning Department. The Kankakee County Regional Planning Department is divided into two halves. The Planning Division, which regulates the use of land and guides development and the Building Division, which is responsible for monitoring both new construction as well as the maintenance and remodeling of existing structures. The Departments jurisdiction lies in the unincorporated areas of the County. On August 30, 2017 starting at 3:00 PM, the Technical Advisory Committee and Policy Committee will consider an amendment to the 2040 Long Range Transportation Plan. FY2018 Transportation Improvement Program is now available for review. Kankakee Area Transportation Study MPO Technical Advisory and Policy Committee Meetings. The Kankakee Area Transporatation Study will hold meetings for the Technical Advisory Committee and the Policy Committee beginning at 3:00 PM on Wednesday, May 10, 2017. The meetings will be held in the 4th Floor County Board Room, 189 East Court Street, Kankakee, IL 60901. On Tuesday, May 2, 2017 at 10:30 AM there will be a County Transportation Committee Meeting in the large conference room at METRO Centre, located at 1137 E. 5000N Rd, Bourbonnais, IL. The Kankakee Area Transporatation Study will hold meetings for the Technical Advisory Committee and the Policy Committee beginning at 3:00 PM on Wednesday, February 22, 2017. The meetings will be held in the 4th Floor County Board Room, 189 East Court Street, Kankakee, IL 60901. There are currently no projects in the system.